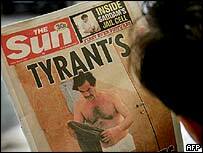 The Sun says this is an "extraordinary iconic news image"
Saddam Hussein plans to take legal action after a British newspaper published photos of him half-naked in his prison cell and doing his washing. "We will sue the newspaper and everyone who helped in showing these pictures," said Saddam Hussein's chief lawyer Ziad Al-Khasawneh, speaking from Jordan. The Sun newspaper said it would fight any legal action and said it planned to publish more photos on Saturday. The US has launched an investigation into how the photos were leaked. The US military and legal experts said the photos - possibly taken more than a year ago - may breach Geneva Convention rules on the humane treatment of prisoners of war. The conventions say countries must protect prisoners of war in their custody from "public curiosity". Saddam Hussein is being held by US troops at an undisclosed location in Iraq as he awaits trial on numerous charges, including murdering rivals, gassing Iraqi Kurds and using violence to suppress uprisings. The photos show the 68-year-old former leader with a moustache, rather than the beard he sported when he was captured in December 2003, and again when he appeared in court last July. The Sun's front page showed him wearing a pair of white underpants. Other pictures show him washing his trousers, shuffling around and sleeping. The Sun quoted US military sources who said they handed over the pictures in the hope of dealing a blow to the resistance in Iraq. "It's important that the people of Iraq see him like that to destroy the myth," the paper's source was quoted as saying. However, several Arab commentators have suggested the photos could increase anti-American feeling in the region. Khaled al-Maeena, the editor of Saudi Arabia's Arab News told the BBC the photos would be seen as "an insult and an affront". The Sun's managing editor Graham Dudman defended the decision to publish the images. "People seem to forget that this is a man who is responsible for the deaths of hundreds of thousands of men, women and children and all that's happened to him is someone has taken his picture," he told BBC Radio 4's PM programme. "This is a sort of modern-day Adolf Hitler. These pictures are an extraordinary iconic news image that will still be being looked at the end of this century." A statement from the US military said it was "disappointed at the possibility that someone responsible for the security, welfare, and detention of Saddam would take and provide these photos for public release". The US military would "aggressively" investigate, the statement said. But President George W Bush said he did not think the photos would encourage insurgents in Iraq. "I don't think a photo inspires murderers. I think they're inspired by an ideology that's so barbaric and backwards that it's hard for many in the Western world to comprehend how they think."